A unique task: make a dead parking lot into a lively new place for Amsterdam. The Stadionplein in Amsterdam was constructed in 1928 as a parking space for the Olympic Games in the Netherlands. Since then, the urban context has changed considerably: from being at the city’s edge in the 30s, the city gate during the construction of the A10, and the space opposite the rescued Olympic Stadium, to being a metropolitan centre and the first extension of the new Zuidas. Meanwhile Stadionplein remained a windy parking lot. 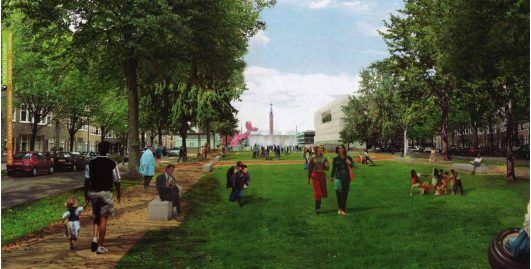 The Oud-Zuid district therefore started a project to make Stadionplein a real residential square. The square is at the centre of cultural history, right opposite the famous Olympic Stadium built in 1928, and in the Berlage Plan Zuid. STIPO was the project manager for the physical change and prepared a design brief for urban development. 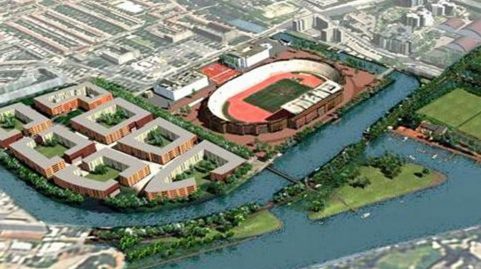 We also set up the Olympic Games Coalition, with the brilliant combination of Olympic Stadium, Rietveld Academy, BouwInvest, Zuidas NV, NOC * NSF and the neighbourhood. To create a living space with the right intimacy and to give the square a food-related programme, two building blocks have been added. They bring a nice mix of local use to the square: shops, café and restaurant, the FEBO, a supermarket, art and culture, parking and housing. The buildings reflect the former Citroen garages, and with the Olympic Stadium, this creates a new urban space with huge opportunities. Floris Alkemade of O.M.A was appointed for the design and a Supervisory Committee was set up with Maurits de Hoog (DRO Amsterdam), Janny Rodermond (Stimuleringsfonds Architectuur) and Marcel Smets (Flemish Construction Master). In all, the basic principles were: strong and user-friendly, a public space with a human scale, a combination of urban scale and neighbourhood scale, the creation of long-term quality, the soul of the place as the basis and the creation of multiple urban spaces. The project included the hardware (design), software (programming) and orgware (coalition).